Russian journalist inside the russian collider. The launch of the Large Hadron Collider in Switzerland last week was of great significance to the world’s scientific community, but it also bore special meaning for Russia, as the project is, in many ways, the product of vast Soviet endeavors in particle physics. The contributions of some 700 Russian scientists not only made the project possible, but also helped rescue some of Russia’s institutes and industrial facilities from imminent demise. It was to international adulation, not to mention a fair dose of hysteria, that the Large Hadron Collider (LHC), the world’s largest particle accelerator, was finally fired up last week. Physicists around the world tried to outdo each other in superlative hyperbole (the “eighth wonder of the world,” and “the Olympics of science,” were two of the more high-flown descriptions). Meanwhile, journalists exasperated them with questions about the project's safety (the Izvestia daily did particularly well in persisting, asking one scientist “if the LHC is so safe, why is it built underground?”). It is natural that the huge machine beneath the Alps should generate such strong feelings. The sheer scale of the undertaking in size, expense and complexity, is genuinely awe-inspiring. And the scientific goals are so mind-bendingly ambitious (especially the way they have been talked up by the physicists themselves) that they were never going to escape accusations of hubris. To recreate conditions a millisecond after the Big Bang in order to find the Higgs-boson (“God”) particle are such extreme goals that, at least in the poetic sense, plunging the world into a black hole seems a fitting way for it to end. Aside from the poetic appeal (the LHC almost certainly will not destroy the world), the LHC has huge importance for science the world over. But it has a special significance for Russia, for the LHC is, in many ways, the product of vast Soviet endeavors in particle physics. And Russia’s participation in the project not only made the LHC possible, but has preserved and rejuvenated that intellectual and industrial legacy. 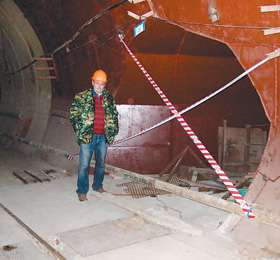 In fact, says Victor Savrin, deputy director of the Skobeltsyn Institute of Nuclear Physics and the head of the Russian team on the project, Russia has not only been involved in the LHC project since its inception, but was already working on its own version long before the European Center for Nuclear Research (CERN's) LHC project had got off the ground. For many years, the Soviet Union led the world in particle physics, opening a particle accelerator at Protvino in the Moscow Region in 1967. For several decades, this one was the largest in the world, and it is still working today. Then, in the late 1970s, Soviet particle physicists started work on an accelerator storage complex at Protvino (UNK in Russian) – a collider almost identical to CERN's LHC. The money for the UNK dried up with the economic meltdown following the collapse of the Soviet Union, and it was never completed. But the 21-kilometer-long tunnel is still there, sixty meters beneath the Moscow Region. The material and intellectual legacy of this project was eventually employed in the LHC. Some 400 magnets were made in Novosibirsk for the transfer line to the main ring of the collider, obviously of crucial importance for the whole project. Contributions were also made to the ATLAS, ALICE and LHCd experiments, but perhaps the greatest single illustration of the Russian contribution was to the Compact Muon Solenoid (CMS), the main detector that will look for the Higgs-boson. The CMS is a 15-meter-high, 21.6-meter long, roughly cylindrical machine occupying a cathedral-sized cavern on the LHC’s ring. It is at the heart of this mammoth construction where the collisions will take place, and the CMS consists of concentric layers of material designed to measure the results. The brass from melted down Russian artillery shells, interleaved with plastic scintillators or quartz fibres, now forms the hadron calorimeter – the part that will chart the movement of particles like protons, neutrons, pions and kaons, the hadrons of the LHC’s title - in the CMS’s end caps. These were designed by another Russian contributor, the Higher-Temperature Technology Centre of NIKIET, Russia’s leading energy institute. It also contains another substance from Russia: lead tungstate crystal. Lead tungstate is a transparent, glass-like material with a peculiar property that physicists call “scintillation” - it emits flashes of light when struck by sub-atomic particles, making it a crucial part of the detectors. “The CMS includes more than 60,000 crystals of led tungstate from the Bogoroditsk Techno Chemical Plant (BTCP) in Tula Region.” Another 10,000 crystals were contributed to ALICE. All of this involves the intellectual and industrial capital built up by the Soviet Union for its own particle physics projects, and that makes the project especially important. It is no secret that Russian science took a great economic blow with the fall of the Soviet Union, as the fate of the UNK project attests. “It is very important for us to save that intellectual potential in the new economic environment, and so we are very pleased to take part in the LHC and projects like it,” said Savrin. The same goes for industry. The orders for lead-tungstate crystals and other components not only preserved the plants producing them, but also earned them several awards for quality and punctuality of production. “But more important is that the technologies developed in the process can be used in different fields – electronics, and even medicine,” Savrin noted. Much has been made of the “brain drain” of Russian scientists to the West since the breakup of the Soviet Union. This is still a problem, but the experience of the LHC may be a model to follow. It was a uniquely international project, but much of the work involved Russian Institutes as partners, rather than simply poaching their staff. And there is still that 21-kilometer-long tunnel in the Moscow Region. “I don't think the collider project will be revived anytime in the nearest future,” said Savrin, “but there is some talk about using it for other purposes, for example measuring how muons from cosmic rays penetrate the earth.” That would be in the distant future, and is a matter of astronomy rather than particle physics, but it still signifies a recovery of Russian science. Savrin is more circumspect than some of his colleagues in describing the scale of the LHC's achievement. “It is certainly a very important and exiting thing,” he said. “It is uncertain about just how much it cost – maybe five billion Euro. But one military airplane can cost one billion Euro. So five aircraft. It's not that expensive.” So maybe we should not be overly impressed by the LHC's material scale or expense. And maybe it will not destroy the world. But it is still worthy of the high praise and poetry lavished upon it, perhaps especially for the role it has had in Russia, where it may have saved a vast intellectual legacy that so easily could have been lost.